Dr. Gash is co-clinic owner of Brecksville Physical Medicine and Revive Medical Spa . He joined the practice in 2009. 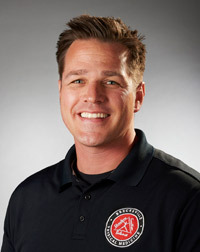 He brings his knowledge of sports and sports injuries, as it was a football injury that led him to chiropractic. He suffered a severe neck injury that threatened his playing career. Chiropractic helped him fully rehabilitate his injury. It was after this personal experience that he decided to become a chiropractor and help others. Dr. Gash did his pre-med studies at Bowling Green State University, where he earned a Bachelor of Science degree in biology. He earned his Doctor of Chiropractic (D.C) degree from The National College of Chiropractic in Chicago, Illinois. Since graduation, he has continued further training in orthopedics, sports injuries and rehabilitation. His extensive study and clinical application has expanded the realm of practice to include gait evaluation and the mechanical relationship between the pelvis, hip, knee, foot and ankle. Dr. Gash has successfully rehabilitated injuries ranging from the acute to the repetitive stress type. He has helped athletes, from the amateur to professional levels, get back into the game.